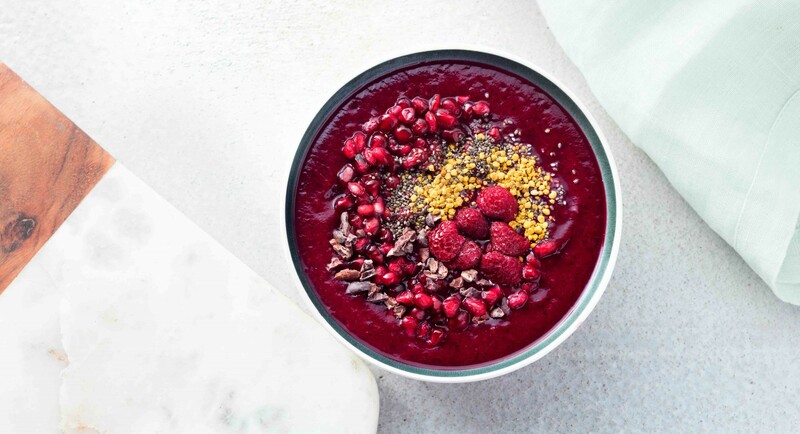 Beets—hailed in Ayurvedic medicine for their liver-cleansing properties—star in this gorgeous crimson smoothie bowl. Topping it off with antioxidant-rich raspberries, pomegranate seeds, and cacao nibs packs in even more nutrients. Place all the ingredients for the smoothie bowl together in a high-speed blender and blend on high until smooth. Pour into a bowl and top with raspberries, pomegranate seeds, bee pollen, cacao nibs, and chia seeds.